Discussing local policing priorities were Jo-Anne Dobson MLA, PSNI District Commander Superintendent David Moore and Cllr Glenn Barr. The PSNI has doubled the number of drug dealers arrested over the past year, it has been revealed. According to a local Ulster Unionist party delegation, the PSNI’s focus on drug dealers has led to the doubling of arrests. UUP MLA Jo-Anne Dobson MLA and Councillor Glenn Barr welcomed the continued action being taken by the PSNI against drug dealers. 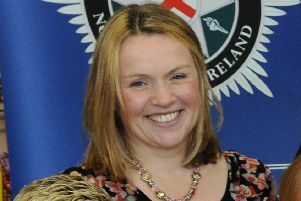 And she welcomed news that work is due to begin soon on refurbishing the custody suite at Lurgan police station. At a recent meeting with PSNI District Commander Superintendent David Moore he revealed the PSNI has doubled the number of drug dealers arrested this year. The local politicians were viewing the new upgraded custody facilities at Banbridge PSNI station which became fully operational recently. Mrs Dobson continued: “Banbridge station has benefited from a significant investment of £800,000 for these new state of the art facilities with Lurgan station in line to receive similar upgrades soon. I welcome this level of investment into Banbridge station and also the fact that their usage is increasing when it comes to detaining those involved in the illegal drugs trade. Cllr Barr said: “I welcome the successes which the police have been having against drug dealers and commend those Officers involved in those successes. “Like so many in the community I want to see those who offer our community nothing but death taken off our streets for good.